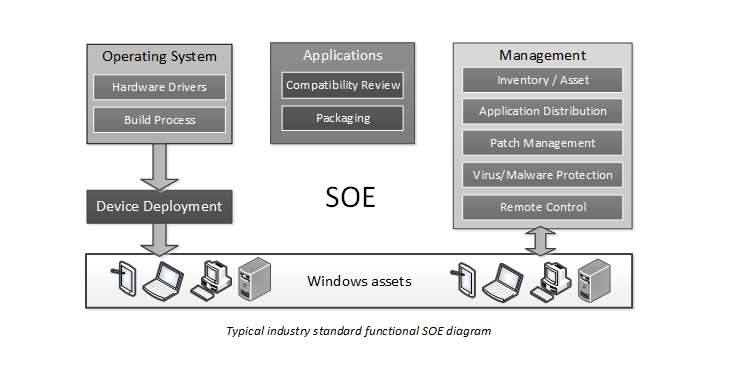 An SOE, or Standard Operating Environment, is one of many IT industry terms used to describe a standardised implementation of an operating system, including associated software and custom configuration. It includes hardware drivers which allow it to be deployed to desktop and server devices, as well as virtual machines. The end goal is to have large numbers of Windows® assets quickly and automatically provisioned, with the desired result being a standardised and managed computing environment. Windows® Imaging – Often termed SOE imaging, an SOE image must be created and configured with customer- and environment-specific settings, applications and hardware drivers. The ultimate output is a single SOE image which can cater for many hardware configurations and automatically adapt to the end-users specific requirements. Applications – Packaging an application enables it to be installed without user interaction and includes customer-specific configuration items. The goal is to enable application installation with minimal user disruption, effort, and cost. Deployment – Once the SOE image is created, it needs to be deployed to targeted Windows® physical or virtual assets. This may be upgrading from an older to a newer operating system, rebuilding faulty assets, or replacing old hardware with new. This process requires a quick and automated SOE image with little or no engineer interaction required. It must be well planned and managed to ensure user impact is minimal. Management – Once a standardised environment is deployed, it must be adequately managed. This includes collecting inventory and asset information, distributing applications and patches, and making support tools such as remote control easily accessible. The staff at impeltec have vast experience in all these SOE components, and have created services which add value and lower the cost for each component. Mouse over the image below to overlay impeltec’s services onto a typical SOE model.